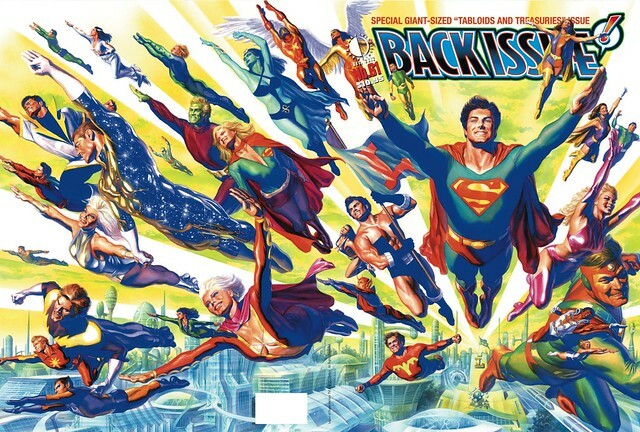 I just discovered this phantasmagorical cover by Alex Ross, featuring the classic Legion of Super-Heroes, for the upcoming Back Issue #61 from TwoMorrows. 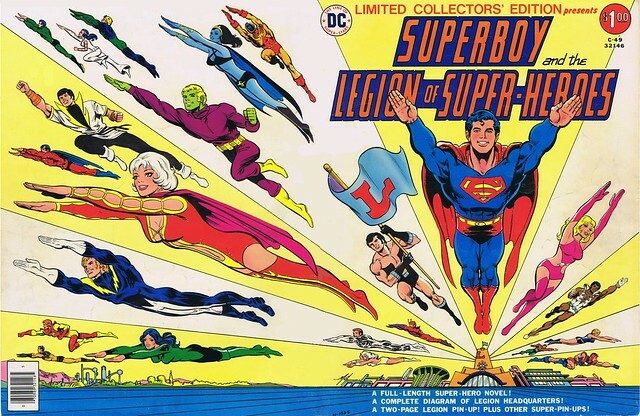 Notice all the 1970s Dave Cockrum and Mike Grell costumes, including Saturn Girl's outfit which robs men of their minds. Superboy's look seems to be based on someone, perhaps one of the actors from the 1980s Superboy TV shows? Alex Ross did this cover as a tribute to Mike Grell's cover for Limited Collectors Edition C-49, from 1976. Ross added many details, including the futuristic city background, and increased the closeup on all the Legionnaires. Back Issue 61 is a tribute to those tabloid sized specials. Sounds great, but we will all have to wait for the end of the year, as this one ships in November 2012! Nuff Said.